Tributes to fallen warriors have been a fundamental part of the human condition since the Trojans mourned their champion Hector within the walls of their besieged city of Troy. Any Viking history nut can tell you how those wandering fighters of old bade their war chiefs farewell in grand style, setting their bodies adrift on a burning warship loaded with all his worldly treasures so he’d be comfortable in Valhalla. So too, in the Eve Universe, there is a time for honoring those who will no longer be among us. The Eve-wide memorial to the recent passing of the beloved Stephen Hawking is an example of the practice of lighting cyno vigils and either eulogizing the departed or maintaining shared silence during the beacons 7 minute duration. On the heels of the Hawking memorial, (arguably the largest such coordinated action in Eve history), famed SLYCE hunter Goto Udan suffered an untimely and unexpected death. 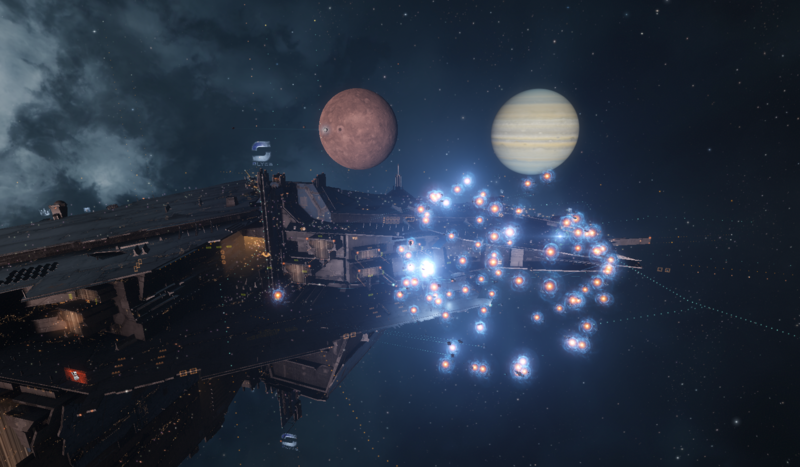 As a beneficiary of his efforts on many GOTG fleets headlined by FC’s like RiotRick, leader of SLYCE Alliance, I participated in the solemn vigil which saw over 150 pilots simultaneously light cynos and share in a small token of remembrance for the many, many Goto lit in his tireless dedication to securing glory for his Corp, Alliance, and Coalition. RiotRick, leader of the deceased pilot’s Alliance and organizer of the touching silent vigil by cyno-light and subsequent fleet, had a few words of remembrance in a brief chat with us after the dust had settled. Yossarian: We’d like to express our condolences on the loss of Goto and our hearts go out to his family. Can you tell our readers a little bit about why he’ll be remembered? Yossarian: Goto was one of those dudes that simply undocked at every opportunity. There’s many members in SLYCE’s community that are like that, quiet but willing to do whatever needs to be done to defend our home, and to achieve objectives. Every roaming FC I have spoken to in alliance and coalition have fond memories of Goto, who wasn’t afraid to lose ships when tackling for his fleet to get the kill. Yossarian: Was this the first memorial for a fallen comrade? RiotRick: His death was a shock to us. Thankfully, his sister was able to communicate to us on our alliance slack (and coalition Discord), to explain what happened and his passing at such a young and tragic age of 31. This is our third memorial that I remember, the last one was for Ski Absolution who died from a tragic motorcycle accident. All of these were done in procurers. This is probably the largest we’ve had. Yossarian: So, the mood on the OP was very different than during the memorial service… Quite possibly the craziest I’ve been on this month so far. Will there be more mutant Procurer fleets or shall they remain sacred? RiotRick: My EVE time is fairly low these days due to family and work constraints, but I think it should always be an option. Hopefully, more FCs will pick it up. If you can beat Caracal fleets in a procurer fleet, you can do wonders with everything else. The roam that followed the memorial was itself a celebration of the way Goto played the game, and indeed, an echo of how our Viking forebears mourned their dead, celebrating a departed’s warrior spirit by seeking to emulate their deeds in life. I only knew Goto as a sometime warping and fleetmate. While those close to him in real life surely feel the loss more acutely than we. We hope that the fact he brought much joy to others in the short time he was with us is at least of some small comfort to those closest to him. May our warcrys reach his ears in Valhalla! And the fact that a 150 man Procurer Whelp fleet ended up ISK positive definitely speaks towards the validity of this tried and true Eve PVP meta. Hey very cool web site!! Man .. Beautiful .. Superb .. I will bookmark your web site and take the feeds additionally¡KI am satisfied to seek out a lot of useful info here in the post, we need work out more techniques on this regard, thanks for sharing. . . . . . Given that the MSM is entirely manipulated, what blogs/websites have you discovered that offer you information that the MSM overlooks?. What is the very best application for posting blogs or write-ups to my web site?